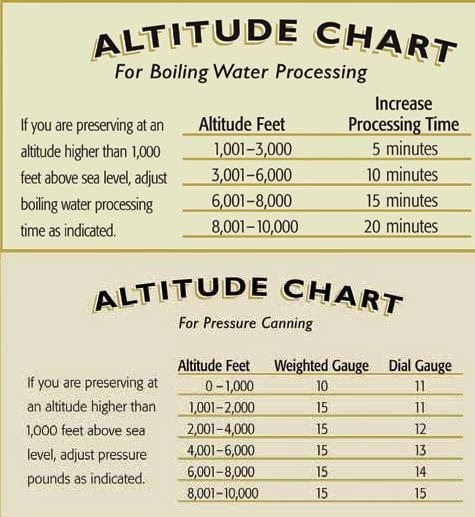 Water Bath versus Pressure Canning - Canning Homemade! Many new to canning maybe wondering what type of process, water bath or pressure canning, they will use for which type of end product. If you are using a safe recipe you will not have to guess. Each recipe will tell you the type of processing required and the allotted time to have the jars in the particular canner. If a recipe doesn't tell you that information it's possible that it's an adaptation and you may want to consult me if it's really safe to can. Water Bath - Uses a canning pot with a rack on the bottom and a tight fitting lid, filled with water that covers the jars with water 1-2" over the top of the tallest jar. Processing time starts once the water comes back to a boil. Once at a boil the temperature of 212 degrees kills bacteria in the contents and allows the lid on the jar to seal once removed from canning pot. Pressure Canning - Uses a special pot called a Pressure Canner which is equipped with a pressure gauge that is either a dial or weighted. The canner has a rack at the bottom and uses only 2 to 3 inches of water added to the pot. The water comes to a simmer, filled jars are added to the canner, a locking lid is then attached. Once the canner comes up to pressure the processing starts. The internal temperature of the canner will reach 240-250 degrees to kill bacteria in the contents of the jars and allows the lids to seal once removed from canning pot. The main difference is that it takes more heat to kill the microorganisms in low acid foods than it does in the high acid foods. That is why we need to do two different processes depending on the recipe. Here are examples of what types of recipes or foods will be processed in which type of canner.